Instagram has formally launched its previously rumoured, long-form, vertical video service, IGTV. 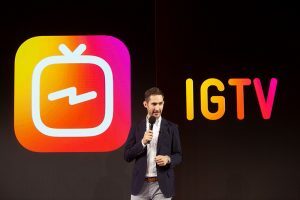 The Facebook-owned photo sharing service described IGTV as Instagram’s “most exciting feature to date” and the beginning of “a new chapter of video on Instagram”. Users are able to access IGTV through a standalone app or within the Instagram app itself. Videos appear in full-screen and vertical format – “it’s built for how you actually use your phone,” the company said in a statement. IGTV videos can each be up to an hour in length. This compares to Instagram video posts which are capped at the one-minute mark, or Instagram Stories which can contain 15-second long video snippets. “Just like turning on the TV, IGTV starts playing as soon as you open the app,” said Instagram in an announcement that was posted to coincide with an IGTV launch event in San Francisco. IGTV is based around channels, with Instagram users able to follow creators to see their IGTV channel content. “Anyone can be a creator – you can upload your own IGTV videos in the app or on the web to start your own channel,” according to Instagram. At the same time, Instagram said that it has passed the one billion user mark, a milestone it hailed as a “major accomplishment” for the 2010-launched company. The IGTV launch sees Instagram take on rivals like YouTube and Snapchat, which teamed up with a host of major TV broadcasters and publishers like National Geographic, Vice, Comedy Central, CNN and ESPN for the launch of its Snapchat Discover platform in 2015. It also marks Facebook’s second major push into video content, following the launch of its Facebook Watch platform last year – a home for episodic content that Facebook said is designed for creators and publishers to “find an audience, build a community of passionate fans, and earn money for their work”. News of Instagram’s long-form video plans first leaked earlier this month.